With AquaSoft SlideShow Ultimate 64bit you can transform photos, videos, text and music into a fascinating movie experience and share your memories in brilliant quality. Experience your photo moments with family and friends! Your photos for amazement - You have not seen your pictures this beautiful. Always put the right cut in the scene and make sure you have appropriate aperture for Wow effects. Of course, with your videos as well! Check Out Now! Show where you were. Not only will you remember your holiday destination better, but your viewers can also make a real reference to your travel itinerary by showing them the way on the map. Map Wizard for retrieving maps in all zoom levels from the Internet. Various map styles such as road map or satellite image. Describe any path with a "Running line". Do images always have to be rigid? Not only to give boredom no chance, but above all to be able to deal with your motifs exactly, you use a wide range of animations. Whether subtle or direct, humorous or playful - a plethora of opportunities. Images, text, videos: you can move and rotate everything along paths. This is how you create your own animations. You can animate camera pans. Thus, e.g. a "Ken Burns" effect or zooming to specific image details are possible. A powerful particle system allows you to have a wide range of animations: from the smoke of a steam locomotive to subtle moving background, rain or gently trickling snow. Collages bring even more life into your presentation. You combine several images, place them on backgrounds or decorate them. 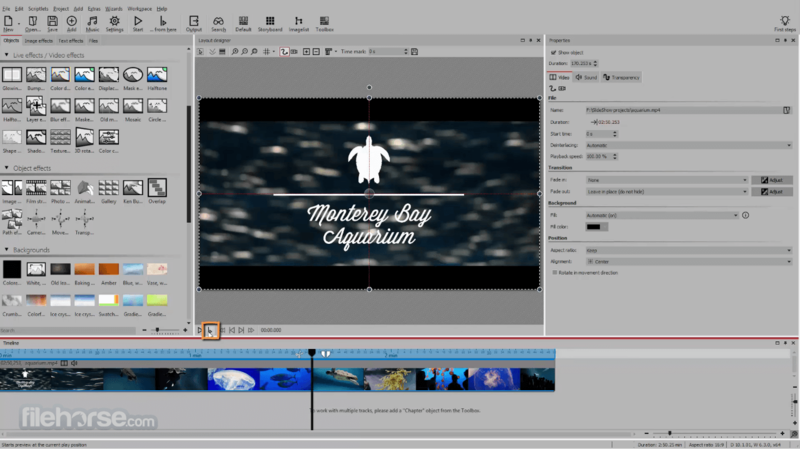 Now, if you animate collages as a whole as well as their individual components, you'll have your own animation studio. Create collages with any number of tracks in the Timeline. Picture in Picture effects! Timeline can be structured with chapters and collages, so that complex animations remain clear. A number of immediately usable design elements are available, such as, e.g., forms or even speech bubbles. There has to be tidiness, and large projects can not be realized without it. Organize your show in chapters and manage multi-hour slideshows with thousands of pictures. Project can be divided into chapters and sub-chapters so that you can comfortably denote your vacation with "Getting there", "Day 1", "Day 2", etc. Finished chapters can simply be collapsed. Storyboard view for easy viewing and sorting of images. No limitation for the maximum number of images or duration of the project. Would you like to give your images and videos a little boost, sometimes? A huge flexible effect palette is ready for you to realize your ideas. 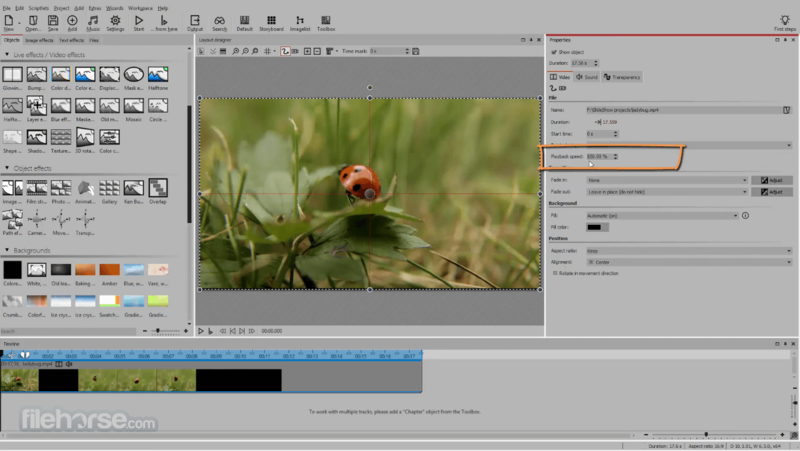 Live effects that affect even animated content and videos, e.g. masks, blur, soft shadows, color corrections, sepia, displacement mapping, halftone effects, mosaic, etc. Object effects that automatically animate or arrange your images, e.g. a transition using a soft "Ken Burns" effect, or a scroll in a filmstrip. Other effects like "old film", camera shake, etc. With the matching background music, you can greatly increase the effect of your presentation. Whether your audience gets goose bumps, laughs, is amused or thoughtful - it lies in your hands with the dubbing. Convenient track for background music with playlist. Automatic fade out of the background music with video or other sounds! Volume can be changed with "rubber band". Add sounds to the timeline, e.g. for noise or speech dubbing. Reach everyone! No matter which device or medium, the versatile output options offer the suitable for every purpose and also for further processing. Burn to Blu-ray and DVD. Upload directly to YouTube, Facebook and Vimeo. Export as video file in all popular formats: MP4, WMV, MPG, etc. Export as animated GIF or as a sequence of images. Export including player software for (also interactive) presentation on PC. Multiple projects with menu for PC and DVD player. 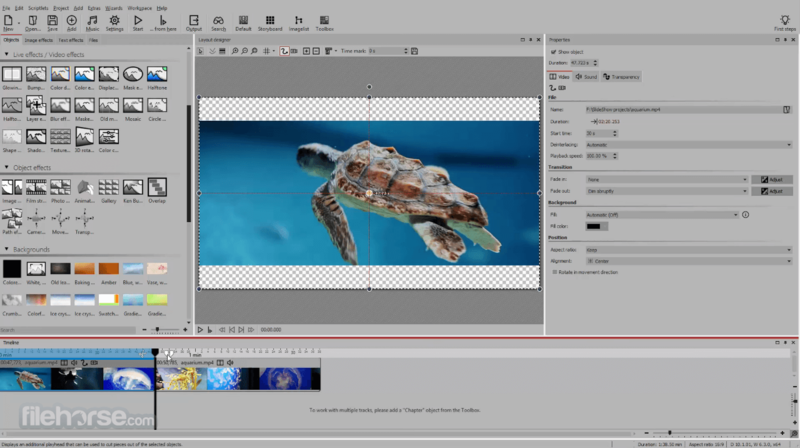 Download AquaSoft SlideShow Ultimate 64-bit for PC today! Note: 30 days trial version. Watermark on the exported project.